Austenitic stainless steel investment casting is the most important investment cast of Taiyuan Simis Company in terms of its better mechanical property and corrosion resistance. 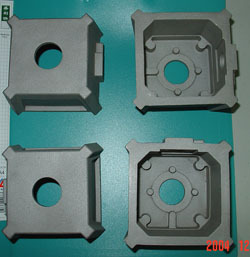 In China more than 90% of investment casting is made of austenitic stainless steel. Austenitic stainless steels are generally used where corrosion resistance and toughness are primary requirements. Typical applications include shafts, pumps, fasteners, and piping in seawater and equipment for processing chemicals, food, and dairy products. • The AISI 200 series (alloys of iron-chromium-nickel-manganese). • The AISI 300 series (alloys of iron-chromium-nickel). Carbon content is usually low (0.15% or less), and the alloys contain a minimum of 16% chromium with sufficient nickel and manganese to provide an austenitic structure at all temperatures from the cryogenic region to the melting point of the alloy. Nitrogen-strengthened austenitic stainless steels are alloys of chromium-manganese-nitrogen; some grades also contain nickel. Yield strengths of these alloys (annealed) are typically 50% higher than those of the nonnitrogen-bearing grades. They are nonmagnetic and most remain so, even after severe cold working. Like carbon, nitrogen increases the strength of a steel. But unlike carbon, nitrogen does not combine significantly with chromium in a stainless steel. This combination, which forms chromium carbide, reduces the strength and corrosion resistance of an alloy. Until recently, metallurgists had difficulty adding controlled amounts of nitrogen to an alloy. The development of the argon-oxygen decarburization (AOD) method has made possible strength levels formerly unattainable in conventional annealed stainless alloys.